When selecting plants, refer to your site map for the project and pay special attention to light and moisture requirements as well as the location in or around a rain garden (basin, lower slope, upper slope), in a bioswale or in the surrounding landscape. For example, basin rain garden plants should tolerate moist soils, whereas plants on a rain garden’s upper slope will enjoy better drained soil. Don’t fight the site! Use the right plant, right place approach to creating a plant list that will perform well in the particular landscape feature that is being designed. Although sunny or partly sunny sites are best for rain gardens and bioswales, they can be built in shady sites as well. 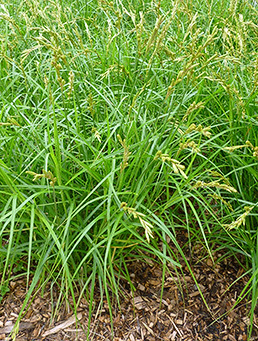 There are several plant species that thrive in shaded sites with moist soils. Take care not to damage the roots of surrounding trees in shaded areas. Plant selection should include species that offer bloom and interest at different times of the year. In addition, pay attention to varying heights, shapes and textures that will be effective for visual impact in the overall design of the garden. See additional plant selection resources. 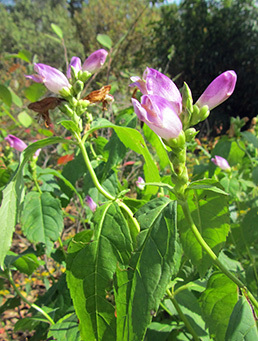 Plan to preserve as many existing native plant species on your site as possible. Mature vegetation contributes to rainwater management by intercepting rainfall, improving soil permeability, and allowing water to naturally infiltrate into the soil. An aesthetically pleasing, low-maintenance landscape can be attained using a plant palette of regionally-native plants. Choose a diversity of hardy native plants—they offer a palette of plants that are well-adapted, beautiful, reliably hardy, enhance much-needed biodiversity while allowing for more opportunities to observe nature. Regionally-native plant species are adapted to our climate and soils, as well as fluctuations in rainfall. 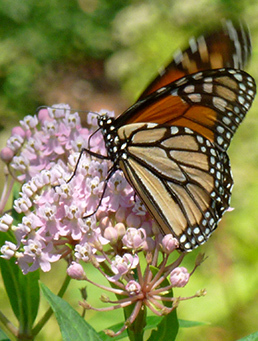 Once established, native plants need minimal irrigation, and the need for fertilizer and pesticides can be eliminated. Many have deep root systems that increase the permeability of the soil and aid in soil stabilization. There are native plants available for every landscape situation, from wet to very dry soils and from full shade to hot sunny sites. They can be used in every design style, from naturalistic to traditional or formal. Always consider the surrounding landscape when designing a landscape with rainwater management in mind. If the surrounding landscape has a traditional, contemporary, or formal design, plan your design to blend seamlessly with the existing design scheme. The plant list, native or non-native, does not dictate the design style—the gardener does. While some native plants are not appropriate for more controlled design schemes (as are some non-native plants), many are appropriate for this design style. Below are some points to consider when deciding whether to use containerized plants or seed for your project. In some cases, projects have blended the two options by planting groupings of containerized plants and using seed to fill in where larger expanses of the same species are used. Another option is to buy seed and grow your own in containers. Small to medium rain gardens (100–300 square feet or so) can be planted and still stay within budget. Planting can be done in the spring to take advantage of spring rains (late March–June) or in September before cold weather sets in. Plants establish more quickly than seeds. Less time is needed for the plants to fill in, mature and flower. A solid canopy of desired plants is achieved in a short time crowds out weeds. Rain garden maintenance is less complex. It is easier to distinguish plants from weeds if plants rather than seeds are initially installed. Large projects (300 square feet or larger) require more plants to cover. Installation costs are lower if the site is seeded. Seeds of different species can be blended to enhance diversity and to provide bloom at different times. Seeded plantings are best installed in winter (December–January). Seeded plantings are appropriate for small budgets. The cost of installation should be balanced against the cost of maintenance which is more intensive in the first 2 years to ensure good growth of desired species and to control weeds. Patience is a virtue as it takes a minimum of 3 years to have mature plants that flower and provide enough cover to crowd out weeds. Go to the Resources page for additional plant lists, plant selection resources and seeding guides. If your garden layout is 10 feet by 10 feet you have 100 square feet of space (10 × 10 = 100). If you choose to plant on 12-inch centers, you need 100 plants. There are a number of plant calculators on the internet; www.classygroundcovers.com is one of the easiest to use.